« A Gal can’t be Thrifty all the Time! As Autumn approaches and my favourite car boot sales close their trunks for winter hibernation, I say bye-bye to 5am weekend starts with boot-sale-burger breakfasts and look forward to jumbling alongside roasts, tea and cake. A duo of vintage events to hang out at this Saturday. Over the past few years London has become a hotbed of mini affordable vintage happenings in pubs, working men’s clubs and the good ol’ jumble sale venue of choice the local church. At this time of year I would usually mourn the closing down of my fave car boots but with so many thrifty events popping into my facebook inbox there’s really nothing to start panicking over. What it does mean is I can now enjoy a lie-in at the weekends and a cup of tea or a cocktail and cupcake or a roast dinner which many of the venues also serve up alongside the thrift. How civilised! 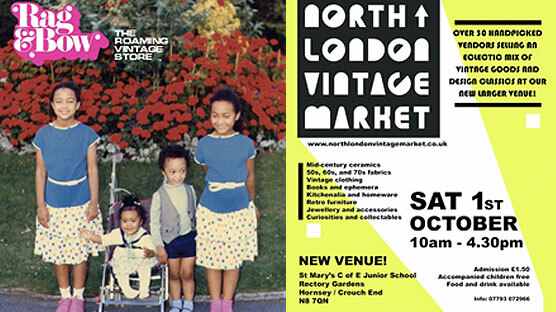 This Saturday I’ll be starting my day at the North London Vintage Market to scour for affordable midcentury knick knacks then heading west to rummage through my pal Hazel’s Rag&Bow rails of super hot vintage threads. Super Sunday jumble and flea markets in East and North London. 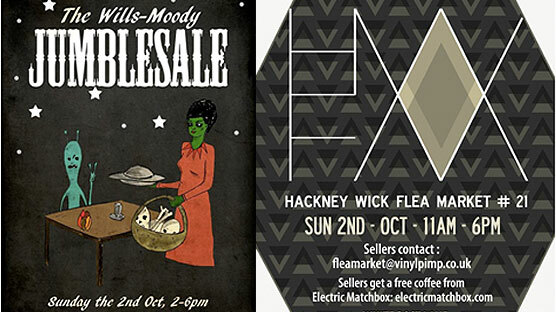 This Sunday I’ll take a short stroll over to my local flea market in Hackney Wick, then head on over to Kings Cross in the afternoon for the super popular Wills Moody Jumble Sale. I’m loving their new location The Lexington which serves up delicious roasts downstairs so you can show and tell your finds over a cosy lunch. Winter thrifting is going to be lotsa fun! Got introduced to your site by a friend. I’m have a yard/furniture sale every Saturday til Xmas, with the 6 Saturday’s leading up to Xmas I’m having a make-it market. Whereby people can have small Xmas pressies made from reclaimed abd recycled wood, on the spot for little cost. And they can can participate in the making and or finishing. Upcycling DIY. Wow that sounds cool Geoff – but where is it? Do you have a website or fb page?